Monday March 20th 1893 We got up very early as Mr Gordon was going away. Josie and I got the washing done early. It rained on the clothes after they were out. Leonard took the paper of the northeast room and the men came to cut the door through. Tuesday March 21st 1893 I was busy about the work all forenoon and gathered up some things to move. We took over another load in the afternoon and brought things back. The men began to hang paper on the rooms up stairs. I did some picking up in the evening. Wednesday March 22nd 1893 It rained all day long. Josie did the ironing and I worked all day fixing bureau drawers and fixing things up to move. I did a lot of baking. 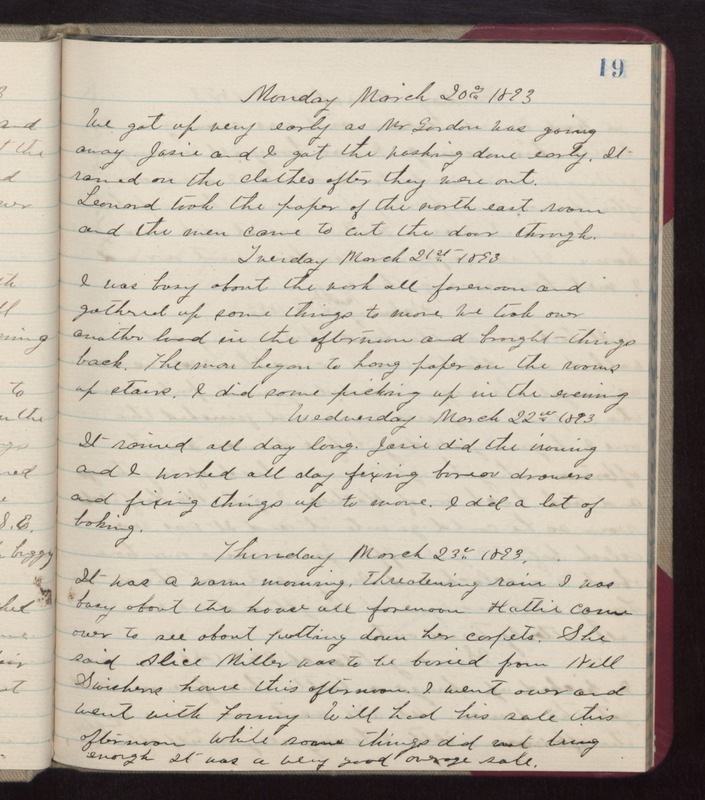 Thursday March 23rd 1893 It was a warm morning. Threatening rain. I was busy about the house all forenoon. Hattie came over to see about putting down her carpets. She said Alice Miller was to be buried from Nell Swishers house this afternoon. I went over and went with Fanny. Will had his sale this afternoon. While some things did not bring enough It was a very good average sale.